Choledochal cyst is a rare entity in which the biliary tract, which runs from the liver to the duodenum (small intestine), becomes swollen. Because of this, the patient experiences abdominal pain, nausea, vomiting, fever, jaundice or even pancreatitis. This is a premalignant condition, which means that if left alone, there is a high risk of developing cancer in the biliary tree. The only way to treat a choledochal cyst is by surgery. 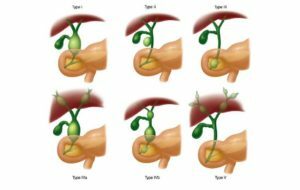 This involves removal of the affected part of the biliary tree followed by restoration of normal anatomy. The extent and type of surgery depends upon the type of choledochal cyst. The surgery can be done by minimally invasive techniques, i.e. laparoscopically or robotically. This usually involves making 4-5 small cuts on the abdomen. Recovery usually takes 2-3 days, and patients can be discharged on the 3rd or 4th day. If done robotically, the recovery period may be even shorter, and the risk of biliary stricture formation is lowered. In unusual cases, like very large cysts or malignant cysts, a conventional open approach may be required.